One of the first priorities your moving professional will suggest is selecting three important dates: Packing, loading the van, and delivery of your household goods to your new home. It is good to allow a time span of approximately 30 days, and it is always recommended to avoid the peak periods, such as the last few days of the month. Decide which items to move and which not to move. Schedule a moving sale to sell those items you will not be taking with you. Other items may be donated to charity for a possible tax deduction. Make personal travel plans for your move, such as airline tickets, hotel reservations and road maps for your trip routing. Set a packing date. We offer professional packing crews that will save you countless hours; but we also offer a full complement of durable cartons should you decide to pack yourself. Gather family records: medical, dental, school, birth, baptismal, marriage, financial, insurance, wills, immunization records for pets. Have schools forward transcripts to your new school system. Electric and/or gas. Ask about refunds. Telephone and/or long distance provider. Make advance arrangements for these services in your new community. Fill and transfer prescription medications for family members and pets. Advise insurance companies of your pending move and update policies. Make separate shipping arrangements for pets and plants. Safely dispose of or give away all flammable materials (paints, paint removers, other solvents, and propane tanks). These items cannot be moved. Defrost refrigerator and freezer. Allow sufficient drying time to prevent mildew. Dispose of food items that require refrigeration. Collect all items from separate locations (office, schools, clubs, etc.) and bring home to pack and move. Make arrangements for child care and pet care on moving day. Transfer funds from checking and savings accounts to new accounts in your new community. Drain fuel, oil from lawnmowers and other power equipment. Pack items to be carried in your car and mark each carton: DO NOT MOVE. Close out safe deposit box. The items from your safe deposit box and other valuables, such as jewelry, should be transported in your car. Send clothing, draperies, curtains and rugs out for cleaning; leave them in the wrapping for the move. Remove and pack bed linens in dresser drawers for convenience. 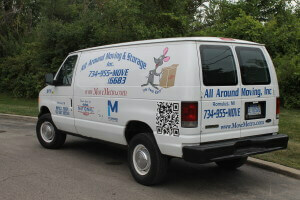 Be available to check items on your inventory sheet as they leave your house to be loaded on the van. When all cartons and furnishings have been loaded on the van, conduct a last minute walk through. Check all closets, make sure windows are shut and locked, lights are turned off and doors are locked. Get copies of shipping documents. You will need to be present to check each item or box off your inventory list as they are removed from the van and brought into your new home. To learn more about the moving process, or to receive a free quote for our moving services, contact All Around Moving & Storage at 734-941-2280.